flowers | An Experience of Nature. Kogelberg rehiked with a new twist. The average student needs some time off every now and again. After a week of studying for a chemistry test, we thought it’s time to treat ourselves. Consequently we let ourselves loose on the Kogelberg 24km trail! As seen in the video it was a clear and hot day. By the time we arrived at the beach our feet were aching and we were in desperate need of some refreshment before the last push home. Jumping into the cool mountain water after the long hike was a feeling I’ll never forget. Another special sighting we made was of the Red Cluster Disa (Disa ferruginea) hidden between the fynbos adjacent to the trail. Being a big fan of orchids, I considered myself very lucky to see this scarce and special flower. I hope you enjoy the video and the photos. Feel free to comment, like and subscribe. Happy 2016 to all readers! May it be filled with lots of wonderful experiences! Grandpa, my sister and I went on our annual expedition up Leopard’s Kloof to view the Red Disas in flower. See my previous post on Leopard’s Kloof to find out more about this stimulating route. The Red Disas grow in the moist moss which covers the rocks surrounding the Leopard’s Kloof waterfall. We spotted one in bloom close to the base of the fall. This is considered lucky because in the past there were many more Disas at lower levels of the fall which have now gone because of environmentally harmful activities like the picking or total removal of these flowers. Orchids (like this one) are some of the most beautiful creations on Earth. Seeing the Red Disas again was an amazing experience. A good kick off to 2016! A mental and physical challenge made easy by beautiful surroundings! Kogelberg 22 km trail (roughly 13,6 miles) meanders around the steep and high Platberg, 910m. What made this route special was how we hiked through different ecosystems including forest, mountain, plateau and river. Needless to say, the fynbos always provide ample photo opportunities. Among other things, we encountered the Red Crassula, the Inkflower, lots of Ericas and the Cape Everlasting. Another special experience I’ll never forget is spotting a beehive. 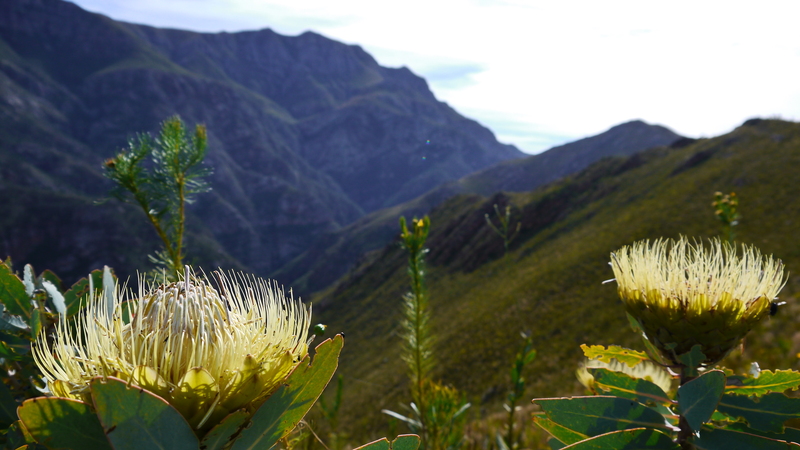 Interesting fact from Kogelberg Biosphere Reserve: Scientists believe that the amazing fynbos’ biodiversity is the result of the southern tip of Africa having escaped the last ice age that destroyed numerous plant species around the world. As such, many of the 8,560 different plant species found in the Cape Floral Kingdom are literally ‘living fossils’. The Cape Floral Kingdom also has more endemic species for its area than anywhere else in the world … some 5,800 species. The location of this trail is the same as the Palmiet River Hike, in Kogelberg Nature Reserve.The reserve lies between the towns of Kleinmond and Betty’s Bay and is easily accessible via a paved road. Permits cost R40 per adult. Wear comfortable shoes, appropriate clothing and water. Nature will always provide with a memorable experience, no matter where you are or what you’re doing! Walking gently in a wide ravine, flowers all around you, birds singing and a big blackwater pool to cool down. A Rejuvenating experience! Boesmanskloof is a one-way hike. Either from Die Galg or from Greyton, depends on which side of the mountain you call home. We hiked to Greyton and back. Boesmanskloof literally means “bush man’s ravine”. The trail is 14km long. I’d grade it as a moderate hike. Approximately half way through a unique waterfall with a circular plunge pool arises, Oakes Falls. This is where I photographed the pink disa in Desember. Lots of other fynbos plants can be spotted including the little turkey. We also found several southern rock agamas with their blue scaled heads and tendency to do “push ups” when you stare to long! A ravine forest. Streams the color of black tea.Twisting past yellowwood and hard pear, towers of the forest. The thundering waterfall displays the red disa along the rock face. The Harold Porter National Botanical Garden (located in Betty’s Bay, South Africa) features the magnificent Leopard’s Kloof Trail. 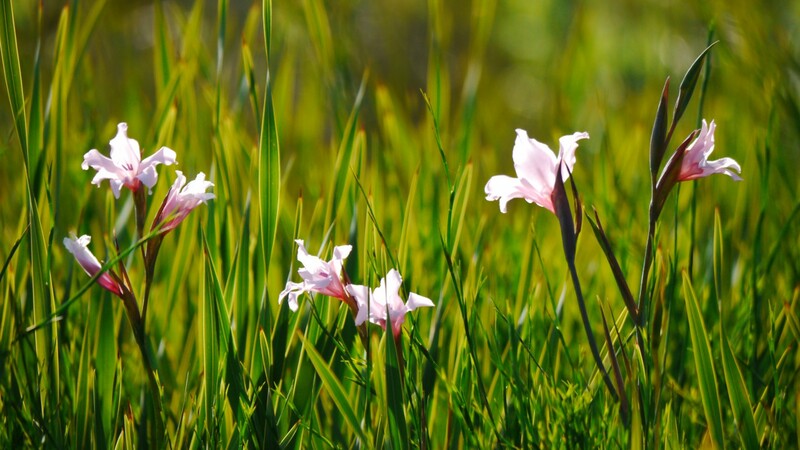 The garden has a rich diversity of cape fynbos, including the renown marsh rose. Pay it a visit any time! Leopard’s Kloof is a refreshing 3km walk in a ravine and turns around at a waterfall where the red disa can be spotted in December. The route has a few wooden ladders, but is otherwise quite easy. The forest is full of ancient, endemic trees like the yellowwood, hard pear and cape beech. A couple of waterfalls comes by where (if the sun doesn’t shine) one can take some beautiful long exposure photo’s. Look out for the metallic glint of the sunbirds in the garden and the small cape batis in the forest. A place to replenish the soul. Make it one of your destinations! Trees and boulders passing by like wraiths in the mist. A baboon barking somewhere in the distance. Surrounded by a white abyss. The hike starts at the old church and takes you 12km over the mountains to the Agterkliphoogte valley. After a night in the luxurious DeHoek Cottage you start with a tough ascent then a descent to Genadendal. Day two’s distance is 9km. Spectacular views – on a cloudless day. Beautiful rocks and refreshing streams. We stumbled across old leopard dung, a reassuring taught, and some beatiful fynbos like the green heath. Money matters. Permits cost R40 per adult per day (CapeNature) and the Cottage cost R150 per person per night (DeHoek farm owner). All the different species of disa one can find amazes me. Keep an eye out for these pretty orchids! Another Blue Disa (Disa venusta). Found on the hiking trail to Hangklip, Pringle Bay. Also in December. Blue Disa (Disa graminifolia). Photographed in March on the Arangieskop trail. Note the spider and the bee. The Red Disa (Disa uniflora). One of the prettiest. This one lives by the Leopards Kloof waterfall at Harold Porter Botanical Gardens, Betty’s Bay. Sited in early December. Golden Orchid (Disa cornuta). I’ve just recently discovered that I photographed a disa. Seen on the Palmietriver hike at Kogelberg Nature Reserve. December. A pink disa (Disa tripetaloides). Found this one in December at Oakes Falls on the Boesmanskloof trail. There are still many I wish to find. Keep a look out for the disa in December. Its important to know which disa you’re looking for, some grow on sandstone slopes while others grow on wet cliffs. A field guide to the fynbos of Southern Africa helps a lot. I’d like to see your disa photos and where you took them.